How would you handle the following scenario? At the end of the day, supper time arrives, but there’s no food prepared. In fact, you’re staring at a cupboard of almost-empty cereal boxes and a random can of peas. In our house, this either means making pancakes or ordering takeout. While neither option is the healthiest, the second makes our budget freak out, and either way it’s not ideal. 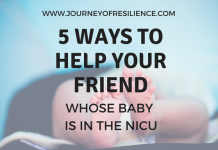 Back before our son with Spina Bifida was born, I did a lot of last-minute meal prep, but it was less of a “crisis” then. I was up for the challenge of creating something yummy with the ingredients we had on hand. I kept a chest freezer and pantry stocked with bulk, organic staples, and getting a pizza or hamburger casserole onto the table was very possible. I got away with not having much of a meal plan, and could just pull things together on a whim. Previously, we had the freezer and pantry space to do bulk shopping, but that all changed with our mold story. Hopefully we can do that again someday, but it’s not possible right now. In addition to not having as many staple ingredients on hand, I don’t have as much flexibility with my time. 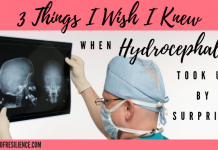 Daily life looks different with the challenges of Spina Bifida. 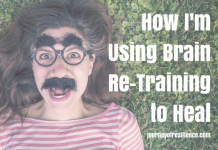 On top of the SB, our son was severely brain damaged last year, so there is an even bigger time commitment to properly care for him than ever before. Between all the cycles of personal care routines, preparing and feeding pureed meals, doing therapies, and driving him to appointments, I also teach the older two kids, make sure they’re fed and on top of their responsibilities, keep up on housework, and somewhere in there have to fit in the prep of our evening meals. Meal plans are helpful, but the forethought that it takes to make and execute one seems insurmountable most weeks. 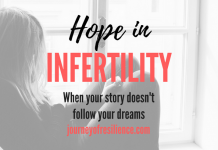 On Sunday afternoons I aim to get the upcoming week planned out in my planner, but despite my best intentions, I often find myself cleaning up the wreck from the previous week instead of thinking ahead to the next. So what happens when it’s an hour until supper and there’s no food in the cupboard or fridge? Well, things have changed around here, and it’s no longer takeout or pancakes! 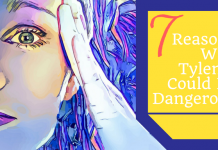 I’m excited to tell you about this tool I’ve been using that has alleviated a TON of stress. By doing an hour or two of cooking every couple of weeks, I’ve been able to put healthy food on the table every weeknight, with very minimal prep the day of! What’s this tool? 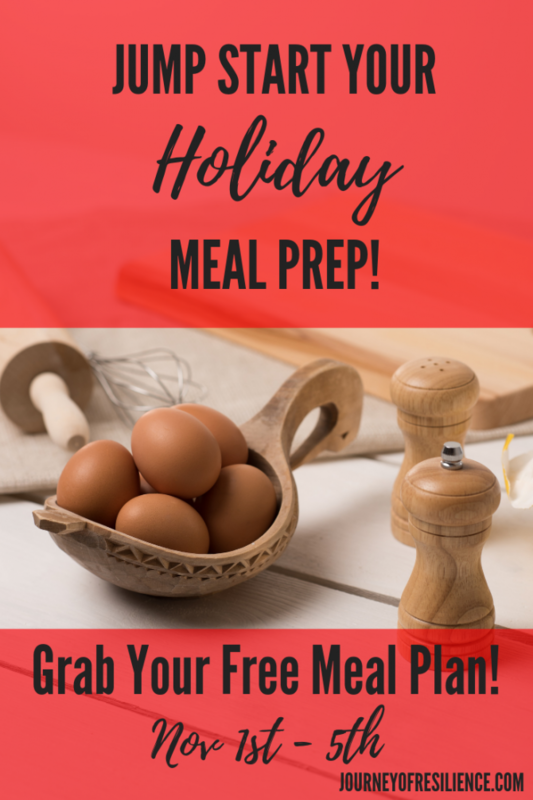 It’s a freezer meal-prep system called MyFreezeEasy, and even with very little freezer space, I’ve easily been able to keep on top of meals for our family. Since it only takes about an hour of meal prep to get 10 to 12 meals into the freezer, I fit it in when I can, and I’m freed from spending a bunch of time in the kitchen every night, starting from scratch (or calling my hubby on his way home from work, asking him to pick something up ?). It takes a few minutes to pull a meal out of the freezer and get it cooked and on the table. The time-savings is incredible! All of the MyFreezeEasy recipes can be viewed without a subscription to the service. As I looked through the categories and recipes, I thought the meals looked simple and flavorful – just up my alley! When you download one of the plans above, you get at least five recipes (equaling 10 meals in your freezer), a shopping list, assembly instructions, and labels for the freezer (I use a marker to write the instructions on the bag instead of printing off labels. Saves a little money ?). 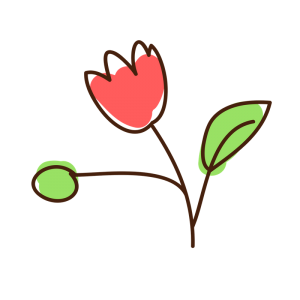 But – and I love this – you’re not limited to choosing from the monthly meal plans! There’s also a “create-your-own” option to make a custom plan. With this feature, you can get even more “choosy” – and it’s so easy to whip up a custom plan and hit print. 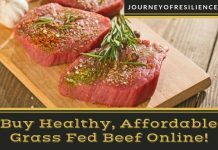 You can browse according to several allergen types, diet choices, and methods of prep, and you have complete control over the number of meals you want included in the custom plan. 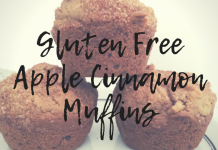 When there are specific dietary needs or picky family members to work around, this option is so flexible! Using MyFreezeEasy has been worth the monthly cost for us – it’s much less than one meal out for our family (it’s $12/month, or even cheaper with a quarterly or yearly subscription). 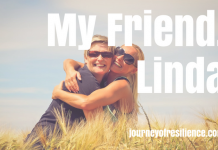 It saves me the time of planning meals and keeps us out of our gigantic “food rut” we get stuck in (my hubby is thankful that the amount of tacos we were eating has diminished. ? I could eat them three times a week – him, not so much). My favorite part is that I can print off a shopping list, and I don’t have to put one iota of thought into what’s going on that list. There’s also an app available, so everything can be at your fingertips on mobile. I’m old-fashioned and like to mark up my list with a pen when grocery shopping, so I haven’t used the app yet. The meal plan and shopping list save me a lot of time, but the real time-saver comes in with the actual food prep. It’s completely possible to get everything cooked, bagged, and in the freezer in an hour’s time. In fact, Erin makes a prep video of the “traditional” meal plan each month. She cooks and assembles everything in real-time, so we can follow along with her and get it all into the freezer in less than an hour. However, if you do it like I do (while watching your latest Netflix binge ? ), it will take a little longer. 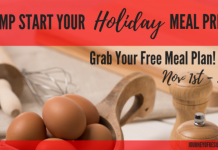 Erin is giving away a meal plan FOR FREE for the next 5 days! 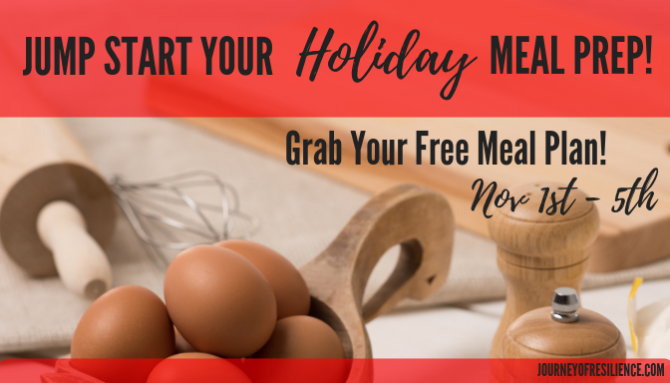 If this sounds like a system that could help your life be a little less stressful, now is the time to try it – because Erin is offering a meal plan FOR FREE! She compiled a plan that will put six meals into your freezer for the holiday season. This is being rolled out NOW, and a “Deck the Freezer” party is happening from November 1st-5th in her Facebook group. The party runs from today through Monday, but this isn’t your typical holiday party. 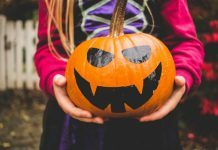 You don’t have to “be there” at a certain time – it’s there for you when you’re ready for it, anytime between the 1st and 5th of November (if only all holiday parties were like this – I could be on time for once! ?). 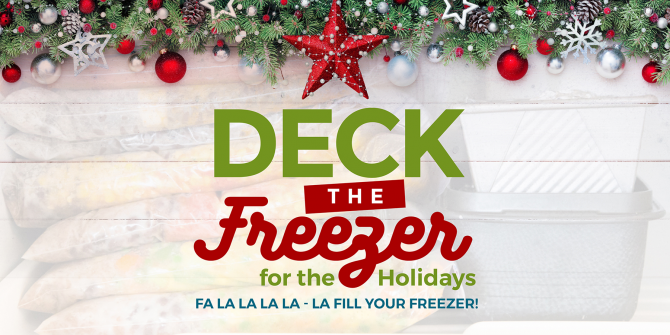 You are officially invited to join us in the first ever Deck the Freezer PARTY!! 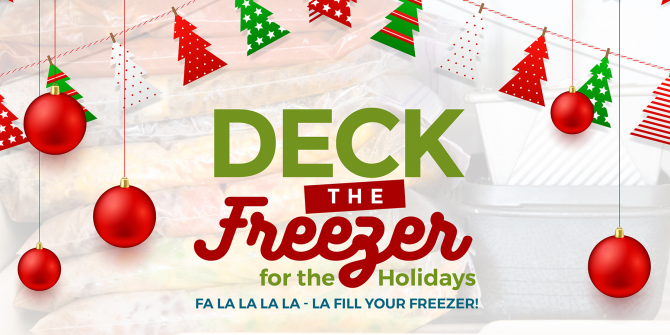 Deck the Freezer with Meals of Jolly! Fa la la la la la la la laaaaaa ? ?When: anytime between November 1st and November 5th – whatever works best for your schedule! ?Where: Comfort of your home sweet home! In your yoga pants and sweatshirt! When you RSVP for the party, you’ll get a link to download the meal plan on the confirmation page, and it will also be sent to your email. The meal plan packet also has all the prep helps you need to shop for, assemble, and freeze two of each recipe! The holidays are coming up SO FAST! This cooking method has been so helpful to me (and my sanity). I hope you can join me and add these meals to your freezer. I’m certainly excited about adding six extra meals to my freezer for the holiday frenzy. ?